*Free for Seniors (age 65 or over), High School Students and under 18; Persons with disability and one person accompanying each of them are admitted free of charge. Free on May 18, International Museum Day . For more detailed information, please see the following page (in Japanese) . Film director Akira Kurosawa’s works are undoubtedly the most frequently and widely circulated and screened all over the world. After Rashomon was awarded the Golden Lion at the Venice International Film Festival in 1951, the name “Kurosawa” became a sensation in the international film world and has become a symbol of the high artistic quality of Japanese films. It has been 20 years since he passed away in 1998, and still his name resounds in the present day. Even for such a master film director, it is not so easy to thoroughly understand the reputation he acquired and which became so widespread. 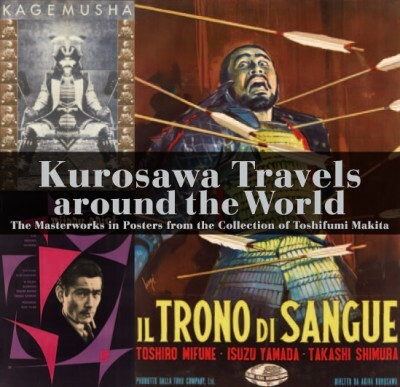 As a special program to celebrate the opening of the National Film Archive of Japan, this exhibition spotlights Kurosawa’s supreme internationality by showing 84 posters of his films from 30 countries, together with other materials related to his connections abroad, selected from the collection of Toshifumi Makita, a researcher specializing in Akira Kurosawa. Kurosawa often said that “film is a kind of international plaza”, where people from every country — beyond Europe and North America — can come together. We hope you enjoy these dynamic and audacious interpretations of his films by designers and painters from each country focusing on the power of Kurosawa’s works as a “global language”.